Our high security professional paper shredding services are available to current and potential clients within the Louth Region of Ireland. The high security onsite and offsite paper shredding services cater for clients throughout the Louth Region of Ireland including towns such as Drogheda, Dundalk, Drumiskin,Dunleer, Grange, Carlingford, Ardee, Annagassan, Blackroack & Carlingford. Louth just to name a few of Our paper shredding services within Ireland are made up of Onsite Paper Shredding, Offsite paper Shredding, Onsite Document Destruction, Offsite Document Destruction, Products Destruction and Electronic Media Shredding (Hard Drives C.D.’s etc). Our responsive Onsite Paper Shredding Services are available to all clients within the Louth Region. Through our industry leading technology we guarantee full confidentiality and security with all of our paper shredding Louth service deliveries resulting in total peace of mind for our clients allowing them to focus on their work schedule. The professional shredding service delivery is hassle free for our clients. One of our innovative paper shredding units arrive onsite at the Client’s location on schedule in order to provide the highest level of confidentiality during delivery. Our Paper Shredding Louth Service can be specially tailored for our clients which will allow it to run securely and efficiently, while not requiring any of our staff to touch, feel or see the clients confidential material (Please See Video Gallery). This is one the influential factors that establish the evidence that our shredding systems are the most secure and confidential shredding systems in operation within the Irish Market. The fully automated shredding systems that we operate within our paper shredding services are yet an additional example of how we have increased the level of security & satisfaction provided to the client (About us). Not only is the paper shredding service the most secure, professional and efficient shredding service available in Louth and throughout Ireland, post service delivery the client is provided with assurance through fully traceable and auditable certificates of destruction and recycling illustrating the clients compliance with waste and data protection Acts (Link to Legislation). In addition to our On site Paper Shredding Louth, our clients benefit from our Offsite Paper Shredding Service in Louth. Offsite Paper Shredding Louth entails our trained shredding staff arriving onsite at the clients location on schedule and collecting the confidential material within our secure bags in order for transportation within our secure collection vehicles back to our premises. With our “Same Day Shred” policy our offsite shredding service guarantees the confidential material will be destructed on the same day of collection eliminating the risk of the client’s confidential paper being stored. 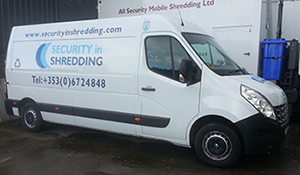 The team at Security in Shredding holds the client as their number one priority and we ensure to work in line with all of the client’s needs and requirements in order to build a strong working relationship. Onsite Paper Shredding Louth Services and Offsite Paper Shredding Louth Services at Security in Shredding provide our client’s with total peace of mind and a long list of essential benefits. As the client is of imperative importance to the team here we are aware that ongoing scheduled shredding services are not required in all circumstances. With this in mind we at Security in Shredding also offer paper shredding clear outs “Purge” shredding services for clients within the Louth Region. Both large and small quantities of confidential material are catered for destroying it beyond both recognition and reconstruction and documentation for full traceability are provided to the client. This responsive shredding service caters for client’s needs through both our Offsite Paper Collection & Same Day Shredding Service delivery and our Onsite Paper Shredding Service delivery for highly sensitive shredding requirements. All of our confidential paper shredding Louth services enables the client to decide upon an option of secure receptacles. Secure Consoles, Secure Storage Sacks and/or Secure 240 Litre Receptacles are available Please see our Product List for further information in relation to our products. For more information on our shredding services in Louth please do not hesitate to contact us.